Dermal fillers are used to restore volume to the cheeks, corners of the mouth (marionette lines), nasolabial folds and lower eyelids (tear troughs). Dermal fillers can also be used to treat areas off label such as acne scars and rigid nose bridges. The hyaluronic acid component transports water to the skin’s surface, which gives your complexion a rejuvenated and supple appearance. To eliminate creases, lines and hollow areas, Dr. Skouras injects a tiny amount of dermal filler into predetermined areas of your face. Treatment usually takes approximately 15-30 minutes, depending on how many areas need to be treated. Dr. Skouras uses products that contain an anaesthetic to help minimize discomfort. Your results will be apparent almost immediately. There is no downtime associated with dermal fillers , so you should be able to get back to everyday activities shortly after treatment. Your skin may feel tender following treatment, but this should subside in a few days’ time. Side effects such as bruising can occur but are not common. You should avoid aspirin and NSAIDs such as Aleve and Advil for two weeks prior to treatment. At the Skouras Eye & Cosmetic Centre we believe in providing a wide range of products for our patients to get the most optimal cosmetic results. This is why we offer several brands of dermal fillers that are best suited for your needs. Book a consultation with Dr. Skouras to determine which brand and product line is the best treatment for you! 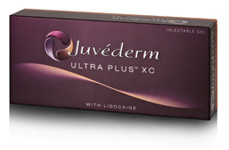 Juvederm Ultra Plus XC: Best used to target wrinkles around the nose and mouth and lasts approximately one year. Juvederm Voluma: Voluma targets the loss of volume in cheeks and chin to create a more youthful appearance that can last up to two years. 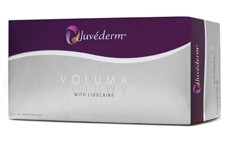 Juvederm Volbella: Used to add volume and enhance the shape of your lips. Volbella creates natural looking lip volume and defining lip contours that last up to one year. Juvederm Volift: The latest of the Juvederm products is best used to soften smile lines, the lines that run vertically from the bottom of the nose to the corners of the mouth. Volift can last up to one year with a single treatment. Depending on your needs, Juvéderm may be used in combination with other treatments such as Botox and Thermage. This will be decided during your consultation with Dr. Skouras. Restylane is clear gel formulation of hyaluronic acid that is specifically formulated to act like your body’s own naturally produced hyaluronic acid, helping to instantly, visibly reduce moderate to severe facial wrinkles and folds or add fullness to your lips. Restylane also offers a line of products to target specific areas of the face. Restylane/ Restylane-L: Add volume to moderate to sever wrinkles and folds around the mouth and nose area. Perlane/Perlane-L: Perlane differs from Restylane in is the average size of the particles and the depth of injection, This allows a deeper injection into the skin for more severe facial wrinkles. To learn more about the revitalizing effects of dermal fillers and other injectable treatments, schedule a consultation with Dr. Skouras today by calling (416) 590-0445.